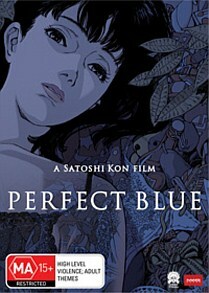 Siren Visual should be commended in not releasing standard anime stories and Perfect Blue is no exception to that rule. Even though this is an animated story, it would actually make an awesome live action film that would make most paparazzi look bumbling amateurs. What do I mean? Read on! The story revolves around Mima, a relatively successful pop star in Japan who is part of the pop group CHAM. Unfortunately for Mima, life as a pop star is not that great and in order to continue making some good money, she leaves the band to become an actress. As her acting career begins, she starts to receive strange letters from a fan who is quite displeased at her choice for leaving CHAM. To compound the situation, these threats become more and more dangerous and eventually her inner secrets are let loose on the web, thanks to a webpage called Mima's Room. As all these threats built up, this causes Mima to question her sanity and it does make you wonder that perhaps all this has been imagined. Best of all, the answers are not clear and even though I had a pre-expecting ending, it had me pleasantly surprised. And without spoiling it, it was a clever twist because I followed the wrong breadcrumb trail. Of course, what makes this release even more enjoyable is the gorgeous and stylised animation that of course makes Mima look quite gorgeous. Some of the dream sequences in the movie are visually quite surreal and only add to this engaging tale. Add in a great soundtrack and some catchy songs from CHAM and this comes together rather well on DVD.